Royal Dutch Shell said it is responding to an oil sheen spotted near its Ursa platform, 130 miles southeast of New Orleans. NEW YORK (CNNMoney) -- Royal Dutch Shell says a sheen of oil, 10 square miles in size, has been spotted near its operations in the Gulf of Mexico, but the company claims it's not to blame. "We remain very confident that the sheen did not originate from Shell operations," the company said in an updated statement Thursday evening. The sheen -- a thin layer of oil floating on the water surface -- is estimated in size to be the equivalent of six barrels of oil. Since the oil was discovered Wednesday evening, it has started to dissipate, Shell said. While the company said that it hasn't officially determined the source, it suspects the oil could have seeped naturally from the seafloor. "It is well studied and documented, most recently by the Bureau of Safety and Environmental Enforcement, that the Gulf of Mexico has a long history of natural occurring seeps, which can on occasion produce sheens," Shell said in a statement. Shell said the sheen is one mile wide and ten miles long and is located in the middle of the Gulf of Mexico, between its Mars and Ursa drilling platforms. 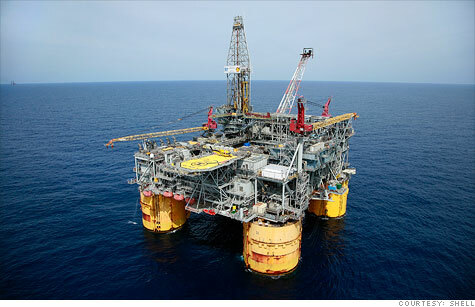 The platforms are both located 130 miles southeast of New Orleans, according to Shell. The Coast Guard said the sheen is located 56 miles offshore from Venice, La. The company said it activated the Louisiana Responder, an oil spill response vessel that has skimming and boom capabilities. U.S. Coast Guard Petty Officer Bill Colclough told CNN that a MH-65C Dolphin helicopter has been deployed to the area for surveillance. "The U.S. Coast Guard is conducting an over flight assessment for a report of a rainbow sheen approximately one mile by 10 miles spotted near the Mississippi Canyon block 807 in the Gulf of Mexico," said Colclough. He said the Coast Guard is "trying to identify the responsible party." Shares of Royal Dutch Shell stock fell more than 3% in premarket trading Thursday, but recovered and ended the trading day up 0.2%. The price of oil rose 94 cents to settle at $103.64 per barrel, rebounding from a recent drop in crude. Dan Dicker, oil trader and author of "Oil's Endless Bid: Taming the Unreliable Price of Oil to Secure Our Economy," said the muted market reaction to the sheen is an indication that it's not as serious as the spill that fouled the Gulf Coast two years ago. "It's controllable," he said. "It's not one of these blasting Deepwater Horizon types that will run uncontrolled for months. When you talk about 10 square miles [of oil], we're all sensitive to it and we should be, but it's a big ocean." One of the worst spills in history occurred in the Gulf of Mexico in April of 2010, when BP's Deepwater Horizon rig exploded, killing 11 workers. The resulting spill fouled the coastline of Louisiana and neighboring states, damaging both the environment and the economy. BP (BP) paid at least $7 billion in spill-related costs, including $5 billion to settle claims from 3,000 people. BP resumed drilling in the Gulf last year. --CNN's Rick Martin contributed to this report.